This month “In Focus” looks Bill Webb who owns and operates the W.H. Art Studio located right here on the main street of Forestburg. Bill is an internationally renowned artist who has made a living, painting acrylic landscapes, for over 27 years. His artwork is sold through several prestigious Art Galleries. 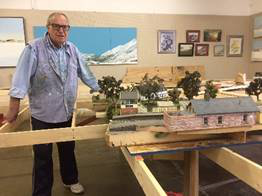 In preparation for Canada 150, and in coordination with the Friends of the Battle River Railway (BRR), Bill is constructing a hand built 600 ft2 pre-WW1 model English Village, complete with a model train with a station and a river. The Friends of the BRR (http://friendsofbrr.com) are offering a rail Excursion “Old Time Market Days” from 12 & 13 Aug 2017 and Bill’s business will be one of the highlights. His business hours will be extended from 9:00 am – 9:00 pm both days. You are welcome to drop by; Bill will be happy to guide you on a journey through his passions of art and modelling. See his art studio where he paints, see some of his original art works on display and learn how Bill has made a living through his art. There will be some exclusive Limited-Edition prints (Mountain Paint – Kananaskis, and Forestburg - Country Road), signed by the artist and available for purchase during this event (Unframe d $85 and Framed $95). Also available, for the art coinsure, some original paintings at a higher value. Bill sells most of his paintings, on consignment, through art galleries (see websites below). But, he is available to paint on concession for individuals. For further information please contact Bill.